Let me start by saying how much I enjoy coming here. That it feels like an escape in every sense of the word: like alone time, but also like the best kind of friendship, where there are comfortable silences followed by periods of intense discussion. It is hard to get here these days, but in some ways that makes it all the more enjoyable when I'm able. I didn't get much of note done today. I washed a set of sheets, hung them out in the sun to dry. I vacuumed the house and cleaned out the fridge and put the girls down for a nap by walking them around the neighborhood a few times in the stroller. I folded three loads of laundry. But Sally and I had a long conversation about frost heaves, and Nora spent a happy afternoon exploring the grass outside. 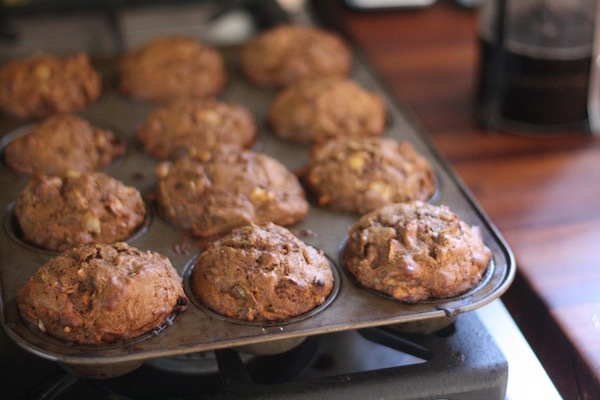 We made muffins, and talked about what it means to adapt a recipe. We took an idea that didn't fit with our mostly local, no-sugar, no-white flour ingredients, and shaped it into something both healthy and tasty. And while it wasn't inventing a self-driving car, or eradicating diabetes, it was satisfying in the way that so many mundane tasks are. I hope you enjoy them as much as we did. The basic idea for this recipe comes from The Apple Lover's Cookbook by Amy Traverso. We've made some pretty heavy adaptations, and the result is a muffin that's packed with fruits and veggies but is also wonderfully satisfying and light. They are best warm, served with big pats of cold salty butter. A note about the apples: I used a Macoun that I got at the Wellfleet Farmers Market. Anything would work, but I think this was an especially nice variety for muffins, because it's simultaneously tart and sweet and is crisp enough to stand up to a little heat. Preheat the oven to 350 degrees F and grease a 12-cup muffin tin. Whisk together the flour, cinnamon, baking powder, baking soda, and salt in a small bowl and set aside. In a larger bowl, mix together the remaining ingredients. Fold in the dry ingredients until just mixed. Spoon the batter into the prepared tin; you will likely have enough for about 15 muffins. Either bake in two batches, or spoon the remaining batter into a small loaf pan and bake it in there. The muffins will need about 20-25 minutes; bake until just cooked through, taking care not to overcook. P.S. If you need a good Sunday evening read, try this on motherhood and smartphones. And in case what you need more is a good laugh. Yum, this might be what I'm baking on one of the coming (hopefully) rainy days. Michelle, I hope you like them as much as we did. They satisfied that fall baked good craving perfectly, and I imagine they'd be extra nice on a rainy day! Intermountain Nutrition is your Industry Leader for Custom Supplementsmanufacturer and Custom Formula manufacturing nutritional and dietary supplements and vitamins.